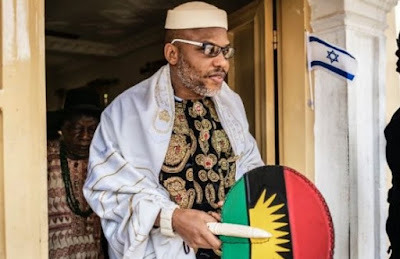 The Federal High Court, Abuja, on Tuesday granted the request seeking to serve court processes on Nnamdi Kanu and the Indigenous People Of Biafra, IPOB, through substituted service. Justice B.O. Quadri gave the order following an ex-parte application by Richard Ndubuaku for an order of court for substituted service of all the processes of the court on the defendants by publishing them in two national newspapers. Mr. Ndubuaku, who made the application through his counsel, Smart Iheazor, also asked the court to make an order restraining the respondents, whether by themselves, members or agents from disrupting the forthcoming Anambra election. He also asked the court to make an order restraining Mr. Kanu and all members of IPOB from interfering, intimidating and harassing all registered and eligible voters in the November 18 Anambra election. He further asked the court to prevent Mr, Kanu and IPOB from mobilising its members either by threat or undue influence to scuttle the election, pending the determination of the originating summons. Mr. Iheazor told the court that his client premised his application on the grounds that Mr. Kanu and IPOB had severally made utterances and threats which were published in newspapers which they had not denied or retracted. “From the antecedents of Kanu and the activities of IPOB, they are capable of carrying out their threat. Mr. Iheazor further explained that the applicant was almost 70 years old and may lose all his life investments in Awka and Onitsha and may not withstand the destruction of his life long struggle. The judge, however, only granted the order of substituted service on Mr. Kanu and IPOB, and refused all the other reliefs sought by the applicant and asked that all parties in the suit be put on notice. In refusing to grant the other reliefs sought by Ndubuaku the judge said that the federal government had the capacity to ensure that elections held in Anambra. He adjourned the matter until October 10 for hearing.